It’s the time of year when we pause to reflect on where we’ve come, so we can figure out where we’re going. Compiling our accomplishments, failures, and unfinished projects, we compare ourselves to internal goals as well as the industry at large. We assimilate the knowledge we gained at conferences and trade-shows, along with the insights of experts, partners and our clients. 2018 has been a year of rapid change for grocery at large, and the pace is quickening as larger risks are being taken with robotics and AI. So what do our in-house experts have to say about the landscape of grocery retail as we head into the New Year? Our COO, Scott DeGraeve, provides us with his top 10 trends and predictions for eGrocery in 2019. 1. Highest Growth Year Yet in the U.S. The majority of grocers are now offering some type of online ordering for their customers. According to a study published by the Food Marketing Institute, the number of shoppers who report using online grocery retailers has nearly doubled over the last three years, from 16% in 2015 to 28% in 2018. The availability, awareness, and increasing desire of consumers for convenience will escalate the growth curve, making 2019 and 2020 pivotal years for online grocery. Many grocers are using Instacart or Shipt for their online offering. At the end of 2018 Kroger launched their own shipping service to stay competitive with retailers such as Walmart, Whole Foods, and Amazon. We will see more of these grocers launch their own offerings for their customers, while continuing to sell on these 3rd party platform providers so they have maximum exposure and an express delivery offering. As volume continues to grow, more retailers will be evaluating and implementing alternatives to in-store pick. Productivity, out of stocks, and aisles congestion are driving retailers to look at multiple fulfillment model options as part of providing an excellent customer experience. We will see multi-format for a growing number of retailers: in lower density areas in-store pick will remain the most efficient model, and busier, dense areas will move to dedicated fulfillment, such as warerooms, dark stores or warehouses. Takeoff Technologies launched the first automated hyperlocal fulfillment center with Sedano’s, Walmart is piloting robotics fulfillment with Albert Innovation in a Salem NH supercenter and 2019 has Kroger readying their first facility in their Ocado partnership. These initial tests will be very important and informative to see if the metrics that are being promised are achievable. If so, it will build confidence and speed how quickly others opt in for rollout. However, using robotics in a micro-fulfillment center will only be impactful to cost of operations where there are large order volumes . Personalization and AI will grow from being just offers and product recommendations to a set of tools that help retailers sell solutions. By 2020 45% of retailers plan to utilize artificial intelligence to enhance the customer experience. Many platforms generate lists that you can buy from, but with machine learning you can now deploy solutions that provide higher levels of convenience for your customers. These AI powered solutions will take into consideration your customer’s dietary needs, past purchase history, and what is already in their shopping cart providing them a highly personalized and engaging shopping experience. Beyond Amazon, we are seeing marketplaces being launched with companies like Albertsons and Kroger. Consumers would like to buy as much as they can from their local grocer and avoid multiple trips to different stores, even digital ones. More grocers will partner with technology providers and 3rd party fulfillment houses to “extend the aisles” beyond what they offer in-store. A robust eCommerce platform can enable a broader assortment for the retailer, an attractive proposition considering they don’t have the operational bandwidth or physical space to do this on their own. This low-risk opportunity will bring added satisfaction to customers plus yield some incremental margin for the retailer. We will not only see this while consumers are shopping online, but also see expansion of retailers using kiosks and mobile equipped in-store associates helping shoppers place orders for items not in the store. Walmart is testing a process where associates help shoppers place an order for items not in-store while the customer is shopping the store’s aisles. Grocers historically have been slow to add delivery to their offering because of fear of the last mile cost. As a result click ‘n collect has been a higher percentage of the mix. We are seeing a shift towards delivery and that trend will continue. Amazon has shaped consumer behavior to an understanding that true convenience is having your order delivered. All the major grocers who may have only been offering click ‘n collect are now rolling out delivery more broadly. Smaller retailers are feeling challenged by this, but they will learn that basket sizes can be higher for delivery which in turn helps to offset the delivery cost. Findings from a survey of 1,000 North American consumers found that the average basket size for delivery hovers around $91 (opposed to click-and-collect at $72), which is roughly 61% higher than the basket size for physical grocery shops. Remember the old joke about waiting for the cable guy, well consumers often complain about having to ensure they are home for a delivery window for their groceries. No one likes waiting around and it’s an unfortunate inconvenience of eGrocery. Delivering food is tricky due to it’s perishable nature, temperature control requirements, and packaging - so it can’t just be left on the front porch. We are beginning to see solutions emerge which allow you to leave the items in a temperature controlled secure receptacle outside of your home. Autonomous delivery is also an emergent trend with Kroger, Walmart, and Amazon leading the charge. In 2019 their testing of these solutions will grow to see if it yields both operational savings and benefits to the consumer. Yes, you can shop for groceries online, in-store and on the go via your mobile. But true omni-channel grocery isn’t there yet given the disparity in pricing between channels and the inability to use in-store sales and promotions via loyalty programs on platforms like Instacart. As retailers roll out eCommerce under their own banners, a more consistent experience across all channels will emerge. And, while perhaps a novelty today, smart speakers with virtual assistants like Alexa, Google Assistant and Siri will start to emerge as another part of the omni-channel mix. Grocery shopping via a virtual assistant has potential given the transaction frequency in the category. eMarketer Retail estimates that there are roughly 70MM voice assistant devices in the United States today and approximately 20% of users with voice assistants are using them to shop for grocery items. The competitive nature and speed of digital has made it very difficult for grocers to build the digital teams necessary to keep up with these rapid changes. In order to succeed digitally, a broad set of components is needed and grocers must invest in flexible technology solutions, such as headless eCommerce, to enable seamless integration with the best in class consumer and operational features that will emerge from a host of 3rd party applications. 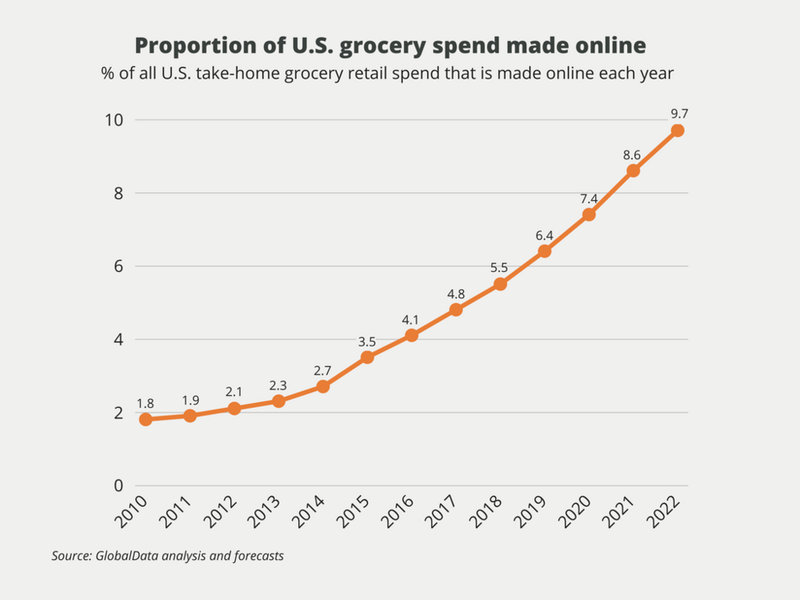 In conclusion, the world of eGrocery is ramping up at an expedited rate and 2019 is bound to be explosive. Retailers need to create strong foundations for growth that are both scalable and flexible in their architecture in order to secure customer loyalty.